Many of China’s most famous landmarks, such as the Forbidden City or the Bund in Shanghai, are manmade but nature has its marvels too. From untouched forests to almost supernaturally colored volcanic pools, photographers will delight in exploring these sites. Many of these natural wonders are located in remote areas of China but the time taken to reach them is more than worth it. We have put together a list of what we consider to be the five most beautiful natural wonders in China. The awe-inspiring geological landforms of Zhangye National Geopark are often named as one of the most beautiful sights in China. The surreal, multicolored landscape is formed of sandstone, laid down by sedimentation over millions of years and shaped into dramatic peaks and troughs by erosion. The parks are crisscrossed with paths and viewing platforms, and there is a bus that travels a set route between the viewing platforms if you would prefer not to walk. 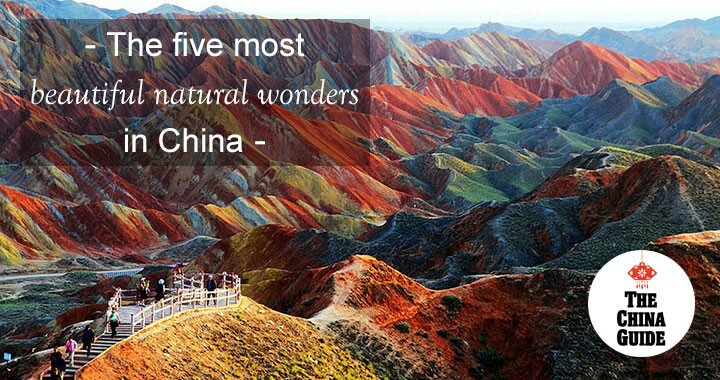 The most popular place to see the peaks, Linze Danxia Scenic Area, is around 40km away from Zhangye city (around a one and a half hour drive). With its crystal clear turquoise pools, primeval forests, towering peaks, and thrumming waterfalls, Jiuzhaigou nature reserve and National Park is without a doubt one of China’s most stunning natural wonders. Jiuzhaigou means “nine village valley”, after the Tibetan villages along its length, and the valley covers 72,000 hectares. The landscape is formed of high altitude karsts shaped my millions of years of tectonic and glacial activity. Even the approach to the area is an adventure: Jiuzhaigou airport sits atop a leveled-off mountain, so you approach at the same heights as the surrounding mountain peaks and land at an altitude of 3,448 meters (11,312 ft) above sea level. Located around 150 kilometers northwest of Chengdu, the Huanglong (literally “yellow dragon”) National scenic Reserve may not be as internationally renowned as Jiuzhaigou but it is no less beautiful. Like Jiuzhaigou, the area is known for its colorful pools, which are formed by calcite deposits. It is also home to several endangered species, including giant pandas and the Sichuan golden snub-nosed monkey. The best and most scenic pools can be found in Yellow Dragon Gully itself, where the layered pools are said to resemble the scales on the back of a dragon. The area was inscribed on the UNESCO World Heritage list in 1992. Tiger Leaping Gorge is a scenic canyon on the Jinsha (Golden Sand) River, a major tributary of the Yangtze River. Depending on how you define it, the gorge is a contender for the deepest gorge in the world. Around 15 kilometers (9 miles) in length, the gorge is located where the river passes between the 5,596-meter (18,360-foot) Jade Dragon Snow Mountain and the 5,396-meter (17,703-foot) Haba Snow Mountain in a series of rapids under steep cliffs. Legend has it that in order to escape from a hunter, a tiger jumped across the river at the narrowest point (just 25 meters wide), hence the name.